Three elections - one just past in two jurisdictions of Eastern Ukraine, a national election in Ukraine coming soon, and a countrywide election in India begins today. Between the three, lots of implications. The BBC puts it this way, ""Self-rule" referendums have been held in Ukraine's easternmost areas, with pro-Russian separatists claiming nearly 90% voted in favour in Donetsk region. BBC reporters at polling stations in Donetsk and Luhansk regions spoke of chaotic scenes, no voting booths in places and no electoral register. At least one person is reported to have been killed by armed men loyal to Ukraine's government. Ukraine called the vote a "criminal farce" organised by Russia. Western countries have also condemned the vote. Separatist leaders ignored a call by the Russian president to delay it." It could be true that of those who actually placed a ballot in a box, that 75-90% indicated a preference for an independent region (from Ukraine), but was it representative of the whole Donestk and Luhansk population? Were others intimidated from showing up at the polls, were the poll booth locations well known, established? All those "details" seem up in the air. And of course, the idea of a modern nation comes with some control as to when elections can be called for - rather than just anyone's whim, or who is armed beyond the recognized authority. So, if nothing else, the procedures of these spontaneous elections in Eastern Ukraine can be learning case studies for what constitutes valid elections, and how representative democracy is ensured. 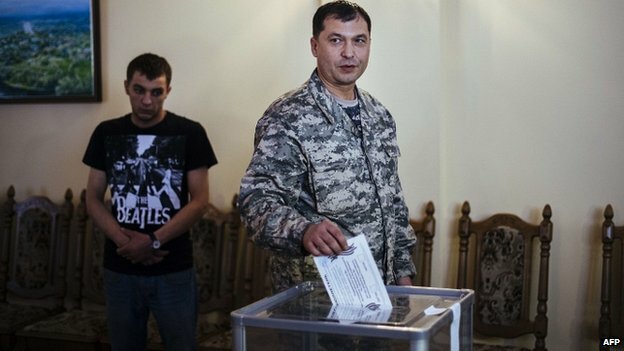 A strange picture - courtesy of the BBC - the uniformed man is Valery Bolotov, the Luhansk oblast's self-declared "people's governor", and the meek gentlemen in the background is there to ... show his subservience? Photobombing to declare his interest in the Beatles? These nationwide elections are the ones sanctioned by the Ukrainian government (which of course Russia nor the Eastern breakaway oblasts nor Crimea recognize. They, Teatree assumes, still hold Yanukovych as the official Ukrainian president, complete with his mansion outfitted with gold-plated toilets ...). The election is to provide all Ukrainian citizens the right to officially signal the legitimacy (or not) of the current leadership of acting President Oleksandr Turchynov who took over after Yanukovych fled the scene. Originally scheduled for 2015, the presidential election was moved forward to fill the vacuum from Yanukovych's departure. It will be monitored by over 1000 election officials from the European Union. The outcome of this election is virtually assured - acting President Turchynov will be installed as a new official Ukrainian leader - and equally likely, it will be a unpredictable, dangerous event. The aftermath of the election will also be fraught with further tension. Though the European Union will be able to deal with an internationally recognized government, Russia will likely not accept the outcome - or simply ignore whoever is legitimized. With the new government in place, the EU is poised to place more sanctions on Russia, while Russia in turn is likely to demand payment for natural gas from the new government - a debt that was growing under Yanukovych, but is now suddenly and spitefully due. What will happen during the election itself in the Donetsk and Luhansk is speculative. At least in Donestsk, the people's governor has said there will be no May 25 voting. Period. Halfway around the globe in the world's biggest democracy, voting has begun which will decide which party will hold the most seats in parliament and therefore provide leadership for this nation. Be it far from Teatree to assume he can begin to explain the myriad of parties and tensions and hopes of all the many platforms, alliances, and rivalries attendant to this vote. So just a few points to make. From wikipedia, we read, "The 2014 general election is taking place in nine phases in India, the longest election in the country's history, from 7 April to 12 May 2014 to constitute the 16th Lok Sabha. Voting will take place in all 543 parliamentary constituencies of India to elect members of parliament in the Lok Sabha. The result of this election will be declared on 16 May, before the 15th Lok Sabha completes its constitutional mandate on 31 May 2014. According to the Election Commission of India, the electoral population in 2014 is 814.5 million, the largest in the world.There is an increase in newly eligible voters of 100 million since the last general election in 2009. ...Incumbent Prime Minister Manmohan Singh has ruled himself out as a prime ministerial candidate." Indian political parties are, to no surprise, numerous. There are 1500 + unrecognized parties, over 40 state parties, and 6 national parties. The two major national parties have been the well known Indian National Congress which has produced a number of leaders with the last name of Ghandi and/or Nehru, as well as the party of India's current Prime Minister, Manmohan Singh. The Bharatiya Janata Party (BJP) party has become the major rival, and what is interesting is its more public stance as a Hindu-based party. The BJP head, a Mr Narendra Modi, if his party triumphs with the largest number of parliament seats, would then become Prime Minister. And early exit polls in today's first day of voting indicates this outcome is likely. A Wall Street Journal article describes the likely outcome and controversy around this candidate, "Mr. Modi appealed to voters by promising rapid development and an economic turnaround in a country fed-up with slowing growth, corruption scandals and indecisive leadership. He is also expected to take a tougher stand on security, particularly with neighbors Pakistan and China. But Mr. Modi is seen by critics—and many among India's large Muslim community—as a hard-line Hindu leader, evoking distrust in a nation with a long history of communal violence. He is accused of not doing enough to stop religious riots in his state in 2002 in which some 1,000 people died, most of them Muslims—events that led to a rejection by the U.S. of Mr. Modi's visa in 2005. 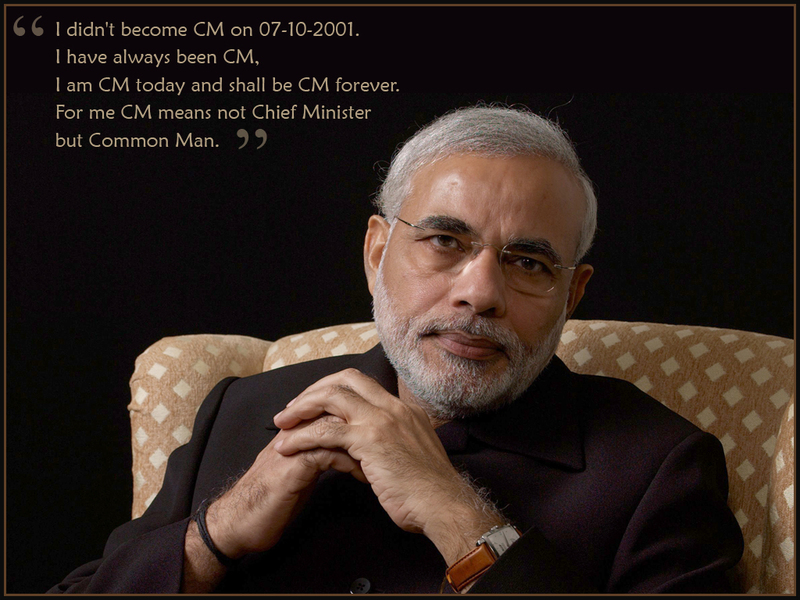 Mr. Modi denies those allegations, and a court in December said there wasn't sufficient evidence to prosecute him." So tensions are intertwined in this election as with most others. However, one item caught Teatree's attention in some of the coverage of the election. A sizable number of Muslims are voting for Modi, because they are ready to accept his statements at face value that he is not favoring any ethnicity or freezing any out. He is for practical development. 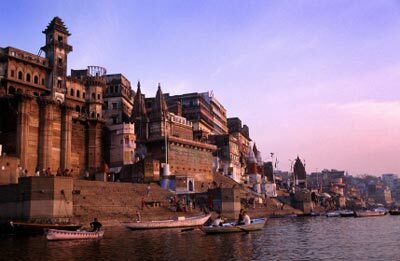 Muslims, especially vocal in the small but well known city of Varanasi, say they are tired of being promised broad tolerant support by the Indian National Congress, yet little results. They are tired of being considered a safe voting pool. They are ready to accept Modi's more immediate promise of practical and focused development projects. It seems like a significant step for Muslims to bravely reach out and support such a candidate. Their position emphasizes that no ethnic group grasping for active involvement within a democracy wants to be taken for granted, be viewed and marginalized as a safe bloc of votes, rather a bloc that is sought out, respected, and made part of responsible governance. So many aspects enter into elections, eligible voters, outcomes, promises, rejections, and governance. The whole gamut is contained in these three elections during May 2014.